Where is my receipt number? 16 digit Receipt Number example. 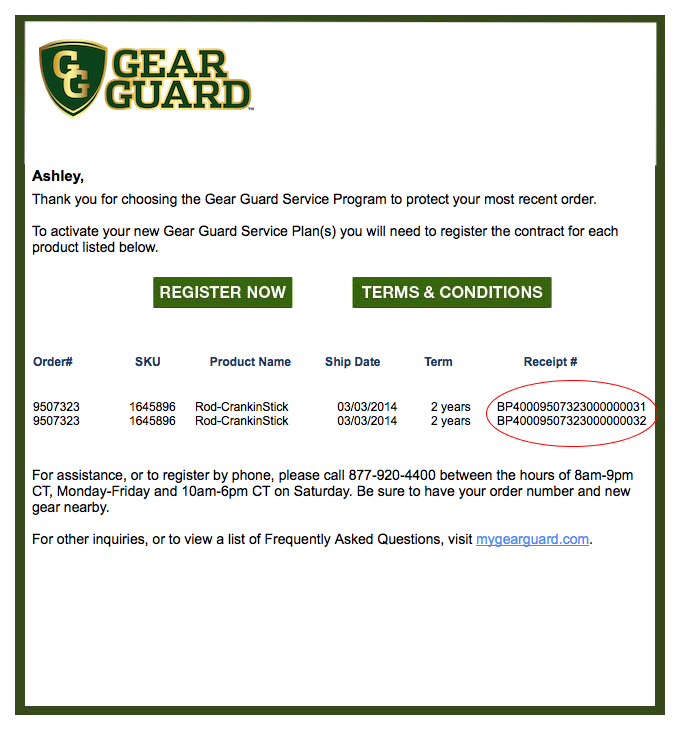 22 digit Receipt Number example. Bass Pro Outdoors Online, L.L.C. takes the privacy of our customers and the security of their Personal Information very seriously. We provide this summary of our Privacy and Security Statement ("Statement") because you have the right to know what Personal Information we collect, how it is protected and used and the circumstances under which it may be disclosed. The complete Privacy and Security Statement may be viewed by clicking here. by letter to us at: Bass Pro Outdoors Online, L.L.C., Privacy Director, 2500 East Kearney, Springfield, Missouri 65898, making sure to include your name and mailing address or telephone number so that we can contact you. Canadian citizens, except under circumstances defined by law, are entitled to access their Personal Information collected by Bass Pro Canada by writing to: Customer Service Privacy Director, Bass Pro Shops?, 2500 E. Kearney, Springfield, Missouri 65898. We may ask you to pay an administrative fee for accessing or copying your information, but will inform you of the anticipated charges and confirm that you want us to proceed before processing your request. If you believe that the Personal Information about you that we have collected is incomplete or inaccurate, Bass Pro Canada will correct the information upon verification of the omission or error and that the person requesting the change is the person about whom the Personal Information relates. If you wish additional information about our Personal Information management practices, to access, correct or have us investigate any matters in relation to your Personal Information, please contact our Customer Service Privacy Director at the address provided above or by calling toll-free at 1-800-552-4868. You are entitled to receive a copy of this information in a standardized format and the information will not be specific to you individually. Our designated email address for such requests is privacy@basspro.com. Bass Pro Outdoors Online, L.L.C does not rent or sell its email address lists. We may share segments of your Personal Information with our affiliated entities as necessary to complete a transaction that you specifically request; for example if you purchase on BassPro.com through the link provided at the quixtar.com site we will disclose the Quixtar IBO number and dollar amount of the purchase made to quixtar.com. Under certain agreements with other web sites that link to BassPro.com, we may share your name, mailing address, email address, and the dollar amount of purchases made after you access our web site through the link. We use a third party analytics service to help us gather and analyze information about our customers; the information we share with that service provider is a customer ID number, an email address, the city, province and a postal code to enable the third party company to conduct its analysis. And, on occasion we provide your name and mailing address to other quality companies whose products you may find of interest. The companies with which we share Personal Information are contractually prohibited from using the information obtained from Bass Pro Outdoors Online, L.L.C. for any purpose other than that for which it was provided and are required to have appropriate safeguards in place to protect that information. For information on how to instruct us not to use your Personal Information for these purposes, see "How You Can Control the Use of Your Personal Information" below. We give you choices and control over the collection and use of your Personal Information. You can update your Personal Information, remove your email address from our email list or remove your name from our catalog mailing list or from lists we share with quality companies. And, you may opt out of individualized data collection done by our third party analytics service. We provide links to affiliated entities and on occasion to other sites we think you may enjoy. These sites operate independently of Bass Pro Outdoors Online L.L.C. and have established their own privacy and security policies. For the best online experience, we encourage you to review these policies before submitting any Personal Information through these sites.